A place to ramble on something and everything. May contain some toxic and addictive contents. My sister had been cooped up in the house for a week without any activities. Kesian. So we thought of bringing her out for fun. What could be more fun than ice skating on a hot day? This is my sister, skating like a pro. Although she spent the first 15 mins clinging to the wall, but not long after that she was zooming around faster than me. 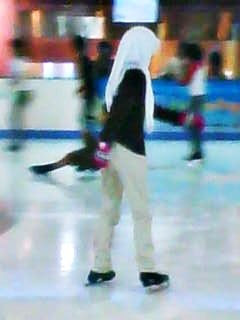 This is me skating like a wimp with Suami Terchenta. We were careful not to bump into any kids, although it was a tough job. 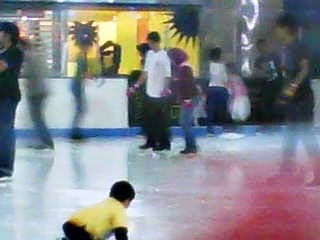 The ice rink was crowded with people, I tell you. Kids fall everywhere macam durian runtuh. Laughing at ourselves after we fell off, despite our best efforts not too. 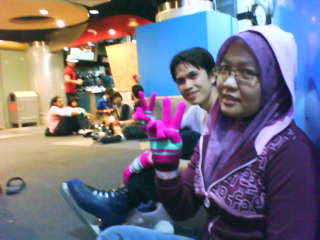 The next time we feel like going here again, we'll make sure we bring our gloves and stockings to avoid the hefty charge. Boleh hangus poket dibuatnya. Mom-of-two-girls. Avid traveller. Hotel enthusiast.